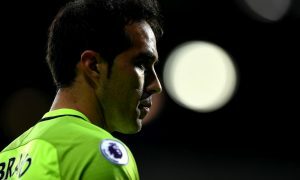 Claudio Bravo remains sidelined with what has been one of Manchester City’s longest injuries of recent years, after the Chilean ruptured the Achilles’ tendon in his right foot back in August. The 35-year-old, who was City’s hero in last season’s Carabao Cup run, played the pre-season Community Shield win over Chelsea at Wembley before sustaining an injury that has kept him out for half a year so far. So when can we expect Bravo, who recently showed up to observe his teammates in training, back in action? Pep Guardiola was asked this question by Chilean journalist Maks Cardenas after today’s demolition job of Chelsea, and still had no return date to offer for the veteran stopper. “We are happy that he [Bravo] is back in Manchester but there is no return date,” Guardiola said. Bravo’s injury forced City to recall youngster Aro Muric quickly from a loan move to NAC Breda and the 20-year-old has been given a good run of games in this season’s Carabao Cup, in which City have again reached the final. It remains to be seen if Bravo will return before the end of the campaign or if indeed he’ll ever play again for City, with USA number one Zack Steffen arriving in July.